These Christmas Chains aren't strictly origami - but they work well with origami paper! Very quick and simple to do, you can also use last year's left over Christmas gift wrap, squares cut from last year's Christmas cards, scrapbook paper, construction paper - even pages cut from spare magazines! Simple get the kids to glue the square together as shown using a dab of glue stick in the corner. You can reinforce the join with a Christmas sticker if you like, or add further decorations. To make the process really quick you could staple the joins and then cover the staple with a sticker. Vary the size of the squares, or keep them all the same. If you want them the same, you might like to cut a template out of cardboard and ask the kids to draw round it before cutting. 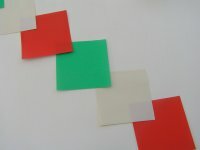 Or use a paper trimmer and cut the squares quickly yourself, and leave the kids to do the assembly and decoration! The finished chains are fun running down the walls or door surrounds, around windows and arches and notice-boards, and over fireplaces. There are traditional origami candle models, but they are very, very difficult! Weve cheated a little, therefore, to create this origami candle for kids to fold, but the finished result is very impressive! These origami Christmas Tree baubles are based on the traditional origami water bomb model. You can make them in all sizes using origami paper, gift wrap cut into squares, scrapbooking paper or any special, glittery paper you can find. This origami church is a little tricky to fold, so it's best for older kids. You can stand it up and have a 3D church (perhaps as part of a village scene), or use it flat for a Christmas card. You could even punch a hole in the top and hang it on the Christmas tree!